By Jamie McKenzie (About Author) This article first appeared in CDW (CDW-G - K-12 EDTECH - March/April 2006 - How To: Nothing But Net) and is republished here with permission. © 2006 CDW, all rights reserved. The secret to effective use of digital resources is good lesson design. Teachers often find these resources overwhelming or unreliable until they have seen the power of Slam Dunk Digital Lessons (SDLs) to structure learning activities in ways that make them efficient, reliable and worthwhile. This article describes SDLs and explains how teachers can build their own SDLs to match local or state curriculum goals. Slam Dunk Digital Lessons are growing popular from New Zealand and Australia to Canada and the USA as teachers recognize their value for translating digital resources into powerful classroom allies. "The Slam Dunk Lesson has spiraled my pre-Advanced Placement science class to a new height regarding higher-level thinking. The students enjoyed the additional challenge the activity provided, and it became apparent that combining the science content with technology became a highly effective motivational tool. Taking Bloom's Taxonomy into consideration, students went from analysis to synthesis in the lesson. Now the students come in every day and ask if we're doing another thinking lesson on the computer!" When the Internet first came to K-12 schools in the early 1990s, there were crowds of spirited pioneers ready to jump on board to test its possibilities. Back then there were joyous surfing expeditions and much talk about transforming classrooms. Early adopters embraced the possibilities of networked digital resources enthusiastically, involving their students in a wide range of activities – everything from WebQuests and multimedia contests to the building of virtual museums. While pioneers were quick to embrace the new information technologies, researchers identified a different group - late adopters – that remained a challenge in many schools (Becker, 1999). SDLs were designed to provide a practical approach to classroom use of Internet resources that would appeal to all teachers but would especially address the concerns of these reluctants in order to win them over to make effective use of the new tools. Corporate studies such as Crossing the Chasm (Moore, 1991 and 2002) have suggested that late adopters in business approach new technologies with a different list of issues and needs than early adopters. Late adopters in schools are usually very serious about their bottom line – student learning and test scores – so they are reluctant to use anything that seems frivolous, peripheral, unreliable or time-consuming. They also tend to prefer structure, order and predictability. The SDL concept was invented to appeal to these late adopters by addressing their chief concerns. One of the best ways to appreciate this lesson building strategy is to view sample lessons on line. You will find a list of districts and lessons at http://questioning.org/slamdunk.html. For a complete description of each of these characteristics, consult "Scaffolding for Success" at http://www.fno.org/dec99/scaffold.html. Each Slam Dunk Digital Lesson is tied to state curriculum standards in two ways. First, the lesson designer identifies the curriculum content to address. The focus may be storms, for example. Next, the teacher selects the thinking skills that deserve attention. Most state standards require students to engage in analysis, interpretation, evaluation or synthesis, for example. An SDL should require original thought at a challenging level. Each SDL includes developmentally appropriate but difficult assessment activities. The designer may incorporate items from the National Assessment of Educational Progress (NAEP) requiring that a student construct an answer to an item rather than relying upon a multiple choice format. To this end, they may employ The NAEP Questions Tool at http://nces.ed.gov/nationsreportcard/itmrls/. Once constructed and tested, an SDL can be posted on the Web and used over and over again by teachers around the world. Slam Dunk Digital Lessons are easy for teachers and students to use. SDLs are jokingly called "Teflon lessons" to capture the idea of no stick and no burn. Directions are clear, simple and easy to follow. Tasks are laid out in pathways that leave little room for error. Of course, this benefit is one that should drop away as students become increasingly independent learners. SDLs help students to internalize the thinking skills needed to operate independently. SDLs fall into two categories: the Six Step Lesson and the NoTime Lesson. 1. The Six Step Lesson – This SDL offers six Web pages or six PowerPoint slides to structure a 30-40 minute learning experience. It may take several hours to build but it may be posted on line and shared globally. 2. The NoTime Lesson – This SDL is usually crafted on a single page and is designed to fit into a teacherÕs busy schedule, requiring just ten minutes on a Tuesday night to create a lesson to use Wednesday morning. It takes practically "no time at all" to build one. In this lesson, students gather information about hurricanes to determine which storm would best qualify as storm of the (previous) century. In contrast to the Six Step model, a NoTime Lesson is much simpler and easier to put together. It usually involves just one page on a word processor and a few paragraphs of instructions. 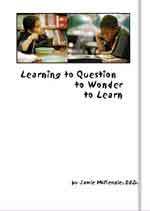 While there are several varieties, each NoTime Lesson points to a chunk of information available on line and asks students to wrestle with one or more challenging thinking task. An English teacher who has led her class through the study of several novels touching upon relationships between groups of men and women like Steinbeck's Of Mice and Men or Winton's Dirt Music, may wish to extend and deepen the students' appreciation of those relationships by asking them to interpret the work of an Australian painter, Russell Drysdale, who shows a man and woman standing in front of a dwelling. The NoTime SDL is a simple file in MS Word. Slam Dunk Digital Lesson" at http://questioning.org/jan06/notime.html. The steps involved in creating a NoTime SDL are quite simple. Identify the curriculum content and State Curriculum goals worthy of attention. Find high quality digital content (Image, Numerical Data or Text). Write a one page lesson directing students to source and outlining expectations for a challenging thinking task using NAEP items as a guide from The NAEP Questions Tool at http://nces.ed.gov/nationsreportcard/itmrls/. The steps involved in creating the Six Page SDL are more complicated. Start by filling out Page Six, identifying the curriculum content and skills you hope to address with your lesson. Find a great Web site that has rich information resources to match your lesson focus outlined on Page Six. Describe that site on Page Two without providing a URL or hot link. Identify an essential question that could be explored using the site you listed on Page Two and place it on Page One. Consider items like those listed at The NAEP Questions Tool at http://nces.ed.gov/nationsreportcard/itmrls/. Outline the learning steps you want the students to follow once they visit the site and place these instructions on Page Three. Formulate a brief but telling assessment activity and place it on Page Four. Provide enrichment activities on Page Five. Copyright Policy: Materials published in From Now On may be duplicated in hard copy format if unchanged in format and content for educational, nonprofit school district and university use only and may also be sent from person to person by e-mail. This copyright statement must be included. All other uses, transmissions and duplications are prohibited unless permission is granted expressly. Showing these pages remotely through frames is not permitted. FNO is applying for formal copyright registration for articles. Unauthorized abridgements are prohibited.